We were going to start the auction today but TW has to go to the doctor. She thinks that a bitey on her hand may be infected. I'd like to blame it on HHGutt, but he's still in KC. Please include TW and this little kitteh in your #pawcircle. Not much going on in the July Calendar. Once again, TW forgot to mark Senile Saturday cos she was so busy making sure no one forgot her birthday. Big deal. I wouldn't let her put the All Star Game taking place on July 10 on it cos not too many of my furrends are interested in it. As you can see, the window is wide open behind me, although it's not when the temperature goes into the upper 80s and above. Click on the calendar to biggify it or just copy it onto your desktop to print out. How could TW forget to mark Senil Saturday ?? Are you practicing your innocent look in this picture? That is such a good photo CK! Free in July great it is the Blogville Olympics. Most aged hoomans forget senile saturday. I wonder why? Yup this aged hooooman forgot Senile Sat. We sure hope that TW is all right and that her hand will be all right. Do let us know when that auction of going to take place so we can post all about it and get people to come. Great picture of you CK. Take care and get better TW. Purrs for your human - cat bites can get pretty icky! Which is why I never bite my human - it means she might have to leave the house and go to the doctor, which is extra time away from me! You look stunning of course and what bitey did your mom get? #Pawcircle for sure, girlfriend. We like your calendar this month, CK. But you shoulda let TW put the baseball game on...we're interested! We hope TW's hand is okay. 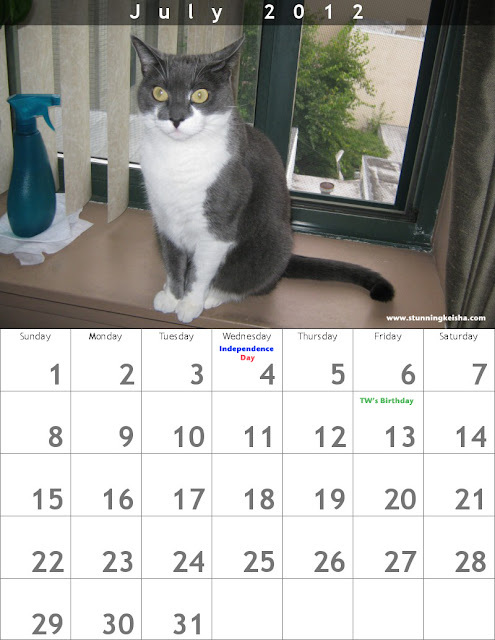 I didn't know you were a calendar girl CK that is a great one to go through the month of July. Ouch an infected bite, purring for quick recovery of TKs hand. You look so purrty, thought it was a statue for a second. How could you ever be forgotten for anything. I say make effurry day on that calendar your stunning day. Our Mom spent the evening with HHGutt over at Harvey's apartment watching Jackson and stuff. She sez the whole All Star Game is all the talk around these here parts! Hoping TW's hand isn't bad - those infections can be nasty....! !